Enjoy the chance to spot anteaters, armadillos, otters, marmosets and even jaguars and pumas. Fantastic bird watching opportunities including toucans, jabiru, macaws and parrots. 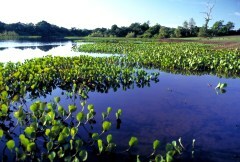 Explore this enormous area of seasonally flooded savannah lowlands and wetlands. Take a safari spotting marine life including caiman, anaconda and a variety of fish. Day 1: Transfer from Cuiabá airport to Rio Mutum Lodge. Dinner and evening at leisure. Day 2: Rio Mutum activities including horse riding, boat safari & nocturnal animal spotting. Day 3: Rio Mutum activities including ecological walk, bird watching, boat cruise, piranha fishing and caiman spotting. Day 4: Morning activity prior to departure transfer to Cuiabá airport. Add in some relaxation time with a visit to the beautiful beaches and tropical islands to the south of Rio including Paraty and Ilha Grande. Combine the Pantanal with a visit to the aquatic playground of Bonito. On arrival you will be met and transferred to your hotel located in the Pantanal, approximately a 3 hour drive away from Cuiabá, the capital of Mato Grosso. Along the way, you’ll observe many kinds of birds, small mammals and typical landscapes. After check-in, you’ll receive an introduction to the lodge and surrounding areas. In the evening, a delicious piranha soup is served just before dinner. After dinner, there will be an introduction to the activities of the following days. The evening is yours to relax at the lodge. After breakfast, there will be horse riding through the jungle and up to the edge of the Siá Mariana bay. 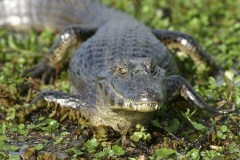 Throughout the year, a large variety of birds, animals and reptiles can be observed. Afterward, you’ll return to the lodge for lunch. In the afternoon, you can experience a boat ride safari in Mutum River. In its crystal clear water it is possible to see giant otters, stingrays and many schools of colourful, small fish. 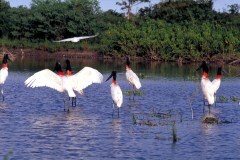 At the Mutum river banks, a large variety of birds can be observed. You’ll then return to the lodge for dinner, and afterward venture out for nocturnal animal spotting by jeep in the lodge’s surrounding area. Later, you’ll return to the lodge for the evening. At 4:30am, we’ll begin canoeing in the Mutum River to observe the sunrise and the beauty of Pantanal wildlife at the break of dawn. Later in the morning we’ll return to the lodge for breakfast and check-out. Transfer to the Cuiabá airport. 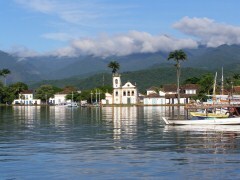 Pousada Rio Mutum sits beside the Mutum River, which gradually merges in two large lakes - Sia Mariana and Chachorore. It is the perfect base from which to explore the Pantanal, the largest swampland in the world and one of South America's top wildlife destinations. *Hotel rates are based on twin share in lead in rooms. Other room types and hotels are available. Rates are subject to change and different rates may apply during holiday seasons and special events. Single supplement will be applied if travelling alone or if you wish to have a room to yourself.